Gov. Linda Lingle continued to market Hawaii in Beijing while meeting with executives of the Tian Wei Group to discuss future collaboration in clean and renewable energy development. The governor and her delegation were the guests of Qiang Ding, president of the Tian Wei Group Co. Ltd. of China, a state-owned enterprise. Tian Wei owns 60 percent of Hoku Scientific, a Hawaii-based solar energy company. The company, headed by Ding and Vice General Manager Jing Chongyou, is the recognized leader in solar power in China, with annual revenues of $3 billion and more than 12,000 employees specializing in solar power, wind and related clean and renewable energy technologies. The governor also spoke at a forum promoting investment in Hawaii and the signing of an educational agreement between Hawaii Pacific University and Beijing Jiaotong University. In addition, Lingle attended a banquet hosted by the China Diplomatic Friendship Association and the Chinese Chamber of Commerce, where she spoke on China-Hawaii relations with an emphasis on scientific endeavors. In the afternoon, Lingle addressed a group of 125 individuals interested in investing in Hawaii at a forum organized by the Department of Business, Economic Development and Tourism. She emphasized Hawaii provides a safe, culturally similar and welcoming environment for Chinese who want to consider investments in the U.S. The governor also gave closing remarks at the signing of the International Education Cooperative Agreement between Hawaii Pacific University and Beijing Jiaotong University. In the evening, Lingle was the honored guest of the China Diplomatic Friendship Association and the Chinese Chamber of Commerce banquet held in the Great Hall of the People, China’s capitol building. The special guest at this event was Lu Yong Xiang, vice chairman of the Chinese People’s National Congress and head of the Chinese National Academy of Sciences. Vice Chairman Lu recently returned from visiting Mauna Kea on the Big Island, the site of the forthcoming Thirty Meter Telescope (TMT). China intends to be a collaborative partner in the TMT project. Lu believes China and Hawaii have a great opportunity to work together in scientific explorations. As he stated, “Hawaii can see the cosmos and the vast oceans — so its horizons are unlimited.” Lu praised Lingle for her foresight in establishing strong relationships with China, demonstrated by her four trips to the country during her administration. Lingle provided a history of the telescope project, including the competition between Mauna Kea and the Cerro Armazones in Chile for the final build site. The governor specifically acknowledged University of Hawaii at Hilo Chancellor Rose Tseng, in attendance at the banquet, who played a pivotal role in Hawaii being chosen as the site for this $1.2 billion project. Lingle thanked everyone for the opportunity to end her trip in such a location as the Great Hall of the People’s Congress, a mark of the strength of the friendship between Hawaii and China. The governor is scheduled to fly Wednesday to Tokyo. 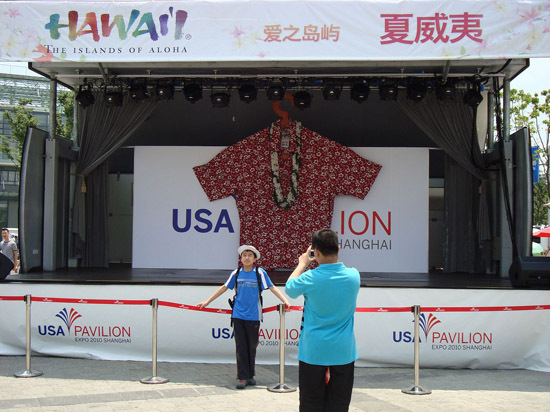 A schlocky giant shirt is being used to represent Hawaii? Why on earth did they pick something from Hilo Hattie?